Bored by Skype's plain-Jane interface? Wish you could jazz up your chats and calls just a bit? Then Messenger Plus! for Skype could be just the thing: This free application lets you add animations and effects to your Skype conversations. Feel like your Skype conversation is missing that certain something? Jazz it up with animation, like these balloons. Messenger Plus for Skype is the second in Yuna Software's Messenger Plus line of products; the first one works with Windows Live Messenger. The Skype version, which is a completely separate application, installs as a thin toolbar that runs along the left side of your Skype window. It features small, square icons that let you access its feature. Most useful among them is the ability to record audio and video calls, which is something that many products, such as easyvoiprecorder charge for. Having it included for free is a nice touch, as is the fact that Messenger Plus alerts both parties that the call is being recorded. Less useful, though perhaps more fun, are the animations and audio effects that Messenger Plus lets you add to conversations. 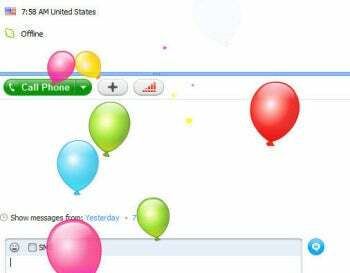 The 36 animations, which include flying balloons, lively characters, and floating kisses, can be sent during Skype chats and video calls, but do require that both parties have Messenger Plus installed. If not, the recipient will be prompted to download and install the application. Unfortunately, my recipient couldn't view the animations overlaid on her screen, as I saw them on my end, even when she had Messenger Plus installed. Instead, she had to view them in a browser window, a step that the company says should be eliminated when both parties are running the latest version of the application. Additional features include the ability to send animated sounds (such as applause, kisses, and a voice shouting "Boring!") are fun, though of limited practical use. The same can be said of the audio and video distortions, which let you apply effects like "reverb" to your voice and "emboss" or "mirror" to your video during a call. They're fun, and work as advertised, but they can grow old quickly. I typically use Skype for business communications, so I appreciate the ability to record calls. And I like that I can use Messenger Plus to share videos and set distinct user ringtones. But, while the rest of its features can be fun, they offer little practical appeal. Add fun animations and video effects to your Skype conversations with Messenger Plus.